Strathfillan comprises two principal settlements, Crianlarich and Tyndrum. It lies in the far north-western corner of Stirling County bordering Argyll. The area is a major junction for road and rail. The A82 from Glasgow and A85 from Stirling & Perth meet at Crianlarich before splitting again at Tyndrum towards Fort William and Oban. The rail lines from Fort William and Oban pass through Tyndrum, which despite its size (100 people) has two railway stations, before converging at Crianlarich and heading south past Loch Lomond to Glasgow. The West Highland Way also passes through both communities and brings 50,000 walkers through the area each year. The communities have developed this role as a ‘junction’ catering to passing travellers and tourism is now the major industry in the area. There are two major hotels that cater for coach tourists, several cafes and restaurants and shops including the famous Green Welly Shop. The communities are perceived as places to pass through rather than destinations in their own right. This perception is something the community are keen to change. The lack of affordable housing opportunities in the area was one of the main issues identified by local people. The problem had been highlighted in a community survey in 1992 which led to new housing being built in Tyndrum. The community believed however that there was a continuing need for affordable housing. This was a view supported by local businesses who were having problems recruiting staff because of lack of housing. 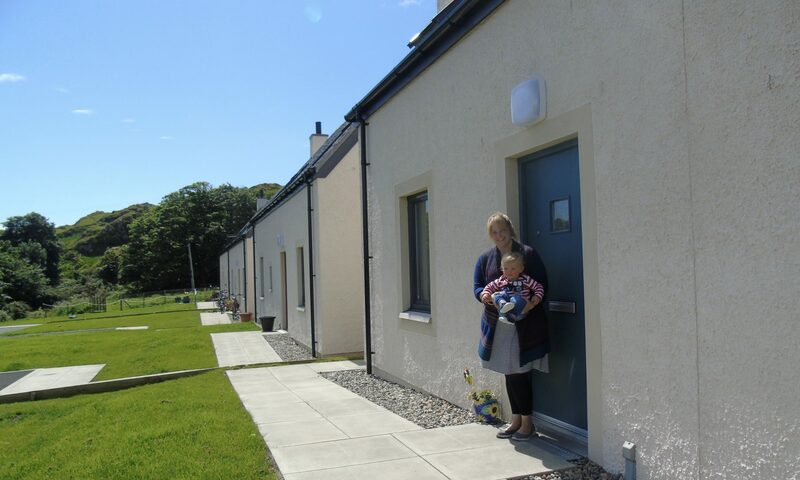 A housing needs survey was carried out by the community under the Corrom Trust program to gauge the current level of housing need and to inform the wider regeneration strategy. An additional aim of the survey was to establish whether there was interest from local people in buying or renting three British Rail houses which had lain empty and blighted the centre of Crianlarich for some years. the community view housing as “the Number One issue”. Crianlarich is closely related to the development of the railway. The main lines from Fort William and Oban converge at Crianlarich as did a third line to Callander and Edinburgh until the early 1960’s. British Rail built a number of properties in the village to house signalmen and line workers. Over the years these houses have been sold off to sitting tenants and on the open market. After privatisation the remaining houses became the property of British Rail Properties Board a residual part of the old BR. Their function is to manage and sell off the remaining BR property . Some of the Crianlarich properties had previously been sold at auction and by 1997 there remained 5 properties, 3 of which had lain empty for six years with little apparent interest by BR Properties Board in maintaining or letting the houses. These properties were a blight on the centre of the village. The community approached British Rail Properties Board in January 1997 to enquire whether the Board would be willing to sell. The British Rail Properties Board were aware of the community’s concern over the condition of the properties and confirmed their interest in selling to the community company, Strathfillan Community Development Trust (SCDT). The Strathfillan Community Development Trust held meetings with Stirling Council and Rural Stirling Housing Association to explore how the houses might be bought and renovated for affordable rent. Stirling Council also provided information on a previous attempt to buy and renovate the houses. An up to date valuation of the houses was obtained and Stirling Council helped to prepare budgets for the project which helped to quantify the amount of grant and loans that would be required to develop the properties. The Trust and Community Council organised a meeting with Stirling Council, Rural Stirling Housing Association, Scottish Homes, Rural Housing Service and Community Self Build Scotland. The meeting considered the development options for the houses. These were: the Trust develop and manage the properties itself or for the whole project to be handed to Rural Stirling Housing Association. At this stage the only funding committed to the project was improvement grant funding from Stirling Council. The Council also included the development in their bid to the Scottish Office Empty Homes Initiative. This bid was however unsuccessful. Despite this setback the Stathfillan Community Development Trust decided that they would take on the project themselves and develop the houses for affordable rent. A chartered surveyor was appointed to negotiate with BR Properties Board and to cost the renovation. He was also asked to manage the renovation contract to enable local tradespeople to tender for the work. The unsuccessful bid to the Empty Homes Initiative left a £150,000 hole in the budget for the purchase and renovation of the properties. This hole was plugged by a grant of £95,000 from the Tudor Trust for the purchase costs and a £50,000 loan from the Charities Aid Foundation to fund the improvement work. The loan from the Charities Aid Foundation was negotiated through their Investors in Society scheme. This loan was awarded over four years. As other banks were reluctant to lend to a new company with no track record the Charities Aid Foundation loan was crucial. It allowed the project to happen and helped the company build up a track record for more mainstream banks to whom the loan will be transferred after the four year period. The low interest rate from CAF also helps to keep rents at an affordable level. The Trust established a Housing Group to manage the development of the project, whilst also maintaining links with the Corrom Trust, Stirling Council and Rural Stirling Housing Association for advice. The redevelopment of the houses began in 1998. The contract to renovate the properties was won by a consortium of local tradespeople who came together to bid for the contract. The work was finished ahead of schedule and within budget. It might have been a difficult process for a Trust owned by the local community to take on the task of allocating houses to members of the community. The Trust considered turning over the allocation and management of the houses to the local housing association or Council. However it was decided that the Trust would do this itself. The Housing Group embarked on training provided by the Chartered Institute of Housing and developed their own allocation policy to reflect the needs of the local communities as well as individual housing need. There were 7 applicants for the four houses for let. The first tenants moved into the renovated houses on 28 September 1999. The Trust also decided to create a local job of housing officer. This is undertaken by a local person who is paid on an hourly basis for being the point of contact for the tenants of the houses. Their hours range from 1 hour a week upwards dependent on the problems with the houses or if there is a change of tenancy. A local contractor is paid by the hour when required. The rents (2001) were set at £184 per month for a two apartment house and £197 for a three apartment house. The rents are set between the council rents and the housing association rents.